Ok. It’s official. I’ve been bitten attacked by the baking bug! This happens every Fall for me. Football returns. The weather gets cooler. And I fire up the oven. Fresh bread. Pies. Cakes. Pancakes. You name it…I probably love baking it! Of course, the fact that crisp, juicy apples are all over the place right now in upstate New York is certainly fueling my baking obsession. (This Apple Harvest Bread and these Rustic Apple Tarts are proof that apples have attacked my kitchen!) But I decided to break out of the apple routine last weekend and go in a completely different direction. It was a lazy Sunday morning, and I wanted to do something fun for breakfast. As I was flipping through my recipe ideas, I landed on Red Velvet Pancakes. Done! They’re fun, colorful, and a twist on the ordinary. 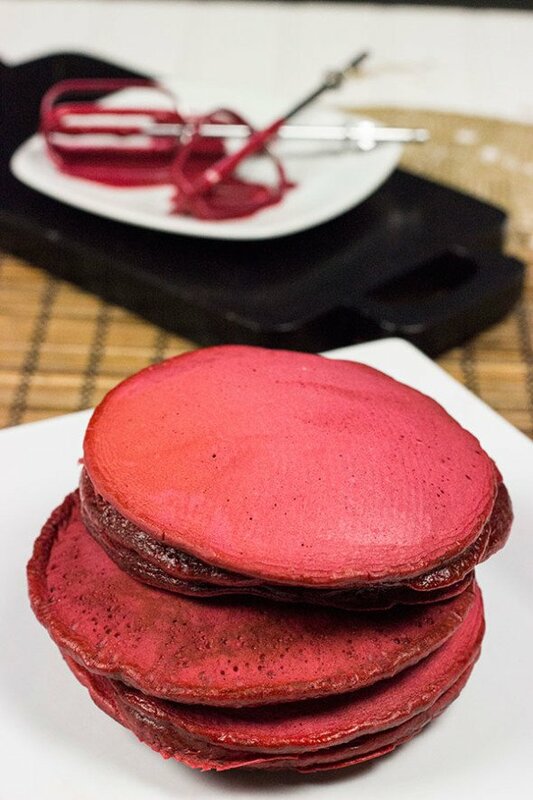 While these Red Velvet Pancakes don’t feature apples…they still totally hit the spot for me! Did you know that the red color in Red Velvet Cakes (or Pancakes in this case) used to come from the reaction between the white vinegar and buttermilk with the cocoa powder? Yup, it didn’t involve loads of red food coloring. Shocking! 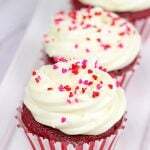 But today, most Red Velvet recipes use red food coloring to get that wonderful red color that we all know and love. 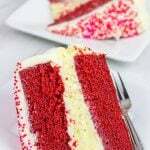 Even many professional bakeries have resorted to red food coloring. So while this recipe for Red Velvet Pancakes does indeed include red food coloring, it still includes the flavors found in traditional Red Velvet recipes…namely the cocoa powder, buttermilk, and vinegar. In fact, the buttermilk addition is what gave me the idea for pancakes. I love buttermilk pancakes, so I figured Red Velvet Pancakes would be a fun idea that still featured that unique buttermilk flavor. Finally, I drizzled a cream cheese icing on top of these pancakes before serving. After all, red velvet cake just isn’t the same without cream cheese frosting, right? So I made a version very similar to what I would use on a cake and then just drizzled the tops of the pancakes with it. Finish with a light dusting of powdered sugar, and you’ve got a fun weekend breakfast that was surprisingly easy to make! In a medium bowl, cream together the cream cheese and butter. Add milk, vanilla, and powdered sugar and stir until well combined. Set aside. In a medium bowl, combine the dry ingredients (flour, powdered sugar, granulated sugar, baking powder, baking soda, cocoa powder, and salt.) Mix well. In a separate bowl, combine the liquid ingredients (eggs, buttermilk, milk, vanilla, vinegar, food coloring, and melted butter). Mix well. Heat a griddle on medium heat. Grease griddle with butter. Pour 1/4 cup of batter into center of griddle. Once numerous bubbles appear in the top of the pancake batter (2-3 minutes), flip the pancake and continue cooking for 1-2 minutes more. Hold pancakes in a 200°F oven until all pancakes are cooked and ready to serve. hehehe. Now what’s better than making an excuse to have “cake” for breakfast?!! These look delicious. I guess there will be a run on buttermilk at the local grocery store. Haha…thanks, SueAnn! Better grab a quart of buttermilk before it’s all gone!! 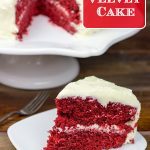 These sound amazing!I do love red velvet cake, now I can have it for my breakfast too. Can’t wait to try this PANCAKE. They look perfect! My taste buds are dancing now with a taste excitation. So I’m definitely going to try this soon and will definitely let you know, how it turned out.I’m sure this is going to turn out pretty awesome. Thanks so much, Christopher! 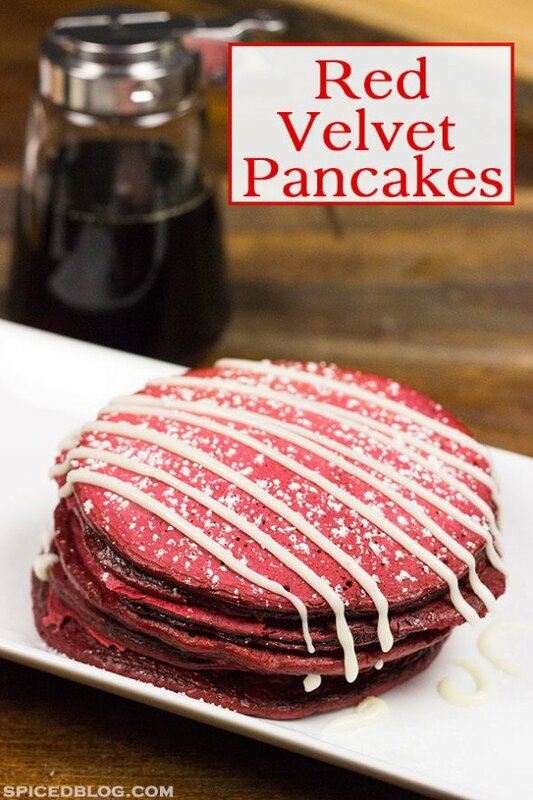 I do love red velvet everything, so it only makes sense that red velvet pancakes would be a favorite around here! And the cream cheese drizzle is a must, too! Enjoy!